Summer offers endless choice for the bride searching for her dream outfit. For our cover, we drew inspiration from the otherworldly beauty of Indian Goddesses and chose to style our cover model in a heavenly fashion. Style Rooms’ luxurious two-piece outfit is for the fearless woman; the bold and beautiful bride who dazzles those around her as brilliantly as the summer sun. The exquisite strapless choli, heavily embellished with stones and detailed stitching creates an attractive embossed effect and strikes the ultimate equilibrium between old and new. The on-trend cropped top is balanced with a gorgeous full-length gold skirt, which flashes and glimmers with every shift. Thanks to the bias cut, the lustrous skirt falls in flattering drapes elongating the silhouette and is perfect for brides of all shapes and sizes. Finally, a net scarf richly adorned with chikan work and dyed in a blend of pink hues accentuates the gold in the outfit to a sublime level. The final effect is a thoroughly summery spin on traditional bridal attire, and breathes new life into the classic regal look. Style Rooms launched its first boutique in Preston, with contemporary and traditional designs inspired by the latest fashions of India and Pakistan. The revered fashion house been making waves ever since and robust growth has allowed the emporium to expand further afield to new outposts in London’s diverse east end. Whether you’re the bride-to-be, a bridesmaid or a lucky guest invited to a series of weddings this summer, you’ll have vast selection of stunning designer party and bridalwear to choose from behind the doors of Style Rooms. Whatever your taste, style or budget, you’ll be sure to find something utterly divine. With a traditional bride in our hearts and thoughts of summer on our mind, we decided to pare back customary bridal beauty and give it a SS15 upgrade. Makeup maverick Sanjeev Dhunna answered our summer cover brief perfectly with MAC cosmetics, running with the Goddess theme with gilded lids to enhance our model’s almond eyes and sunkissed skin on her warm olive complexion. The timeless look that brides have worn for the generations, now revitalised and ready for the season. Defined contouring over a hydrated base is given a radiant glow with shimmery MAC highlighter along the cheekbones and under the eyes while soft smokey eyes and deep pink lips bring the look to a bewitching conclusion. Hair is pinned up in loose, curled sections, with extensions helping to provide additional volume. Sanjeev teased the crown to create a suitably grand setting for the mattapathi tika while curls were quickly finger combed for a natural wave. A final haze of hairspray finishes the look. 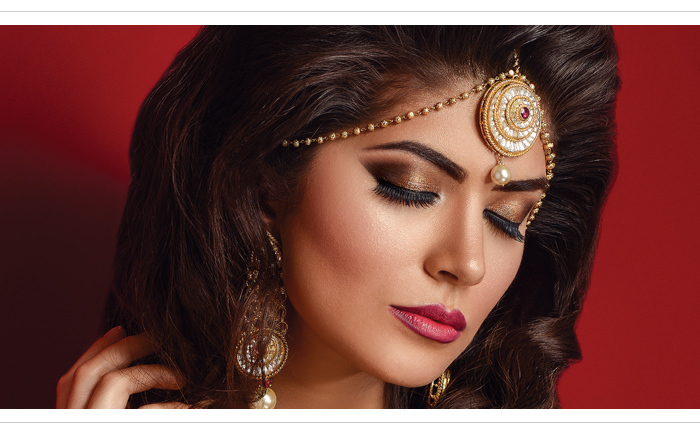 As one of the few male makeup artists in the Asian Bridal makeup industry, Sanjeev Dhunna is a rarity. The hugely gifted Hertfordshire-based hair and makeup artist has been working in the industry for just four years and in that time has already established himself as one of the brightest stars in the business. From his St Albans studio, Sanjeev creates exceptional beauty looks, for commercial, fashion and bridal clients across the UK and beyond. The multi-talented artist recently collected an NMUA award for Outstanding Asian Bridal Makeover Achievement 2015. Our summer cover is all about updating the traditional look to create a 21st century modern classic, so with Style Rooms’ outfit forming the foundation all that was left was the perfect accessories and jewels as the proverbial icing on the cake. The Khush Creative team turned to Midlands-based jeweller Anees Malik and his magnificent collections of traditional ornaments and pieces to provide the final touches to our cover look. The set we plumped for is steeped in heritage and incorporates plenty of antique chainwork. Traditionally worn by Jaipuri brides centuries ago, Anees Malik’s bridal set uses high quality Kundan stones and is given an update for SS15. Ornate yet lightweight, the piece is ideal for summer as it provides a subtle glimmer and works in harmony with the bridalwear, while remaining a statement piece. And brides will get serious mileage from this set since it pairs well with western evening wear, fusion gowns and traditional saris, allowing you to wear the pieces long after the Big Day. A mattapathi tika sits regally on the forehead, staying loyal to the spirit of the modern classic bride. Earrings, an armband, smaller necklace, bangles and panja offer additional decoration to the luxe look. The sari belt, separate from the jewellery ornaments, is an old school accessory that’s undergoing a revival and is on course to be a key trend this season. Originally worn as a symbol of wealth, power and status, the belt completes the look and is adorned with lustrous pearls, Kundan work and tiny bells, finished with gold gugri.